Sometimes the most ordinary things can be made extraordinary simply by doing them at home. 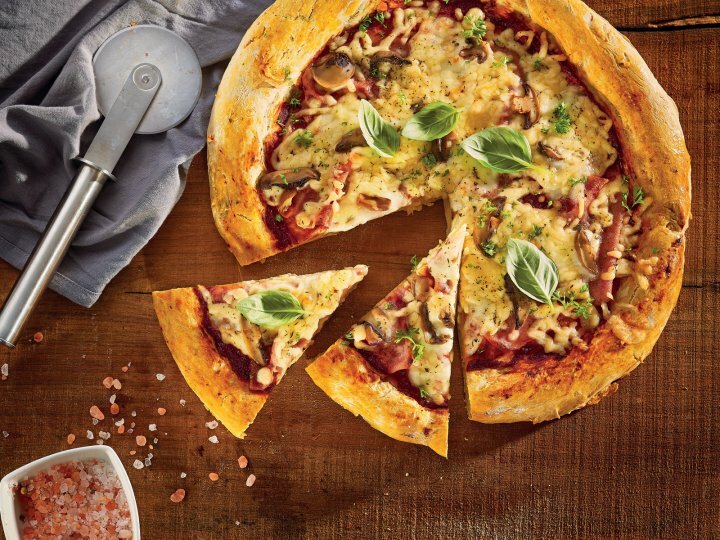 Make everyone happy with this pizza with perfectly melted cheese spilling from the crust. First prepare the starter. Add crumbled yeast, flour, sugar and salt into 1 dl of lukewarm water to obtain a smooth mixture. Let it rise for approximately 5 minutes. Then prepare the dough. Pile the flour in a bowl. Make a well in the middle and put the starter into the well. Add salt and oil and top with water. Slowly knead the mixture into smooth dough. Cover it with a cotton towel and let it rise in a warm place for at least 30 minutes. Roll out the dough and place it on a baking sheet covered with parchment paper. Spread your base with the tomato sauce. Top with ham, mushrooms, fresh cherry tomatoes and mozzarella, sprinkle with some oregano and grated cheese. Now, if you have an automatic program for pizza, just run it and in 14 minutes enjoy your homemade pizza. Otherwise, preheat the oven to 230 °C and let it bake for approximately 14 minutes until crisp."